Do you have a bad case of dry cracked feet from walking barefoot or in sandals this summer? It’s time to get them feeling soft and restored again! Mix all the ingredients together until they are well combined. The final product will be a little grainy but that’s ok! When you are ready to use the scrub, simple rub on your wet or dry feet either outside or with a towel underneath your foot to catch the sugar granules instead of letting them fall on the floor. Rub into your feet and leave it on long enough for your feet to absorb all the scrubbing goodness. After you’ve let it sit for a few minutes, wash off or wipe off with a wet towel (you may want to do this over the bathtub or outside as well. You can follow the rinsing with a nice peppermint lotion or just leave your feet as is. Lotion will help lock in the softness and moisture that you just added in and if it’s a peppermint lotion it will help energize and reinvigorate your feet. The sugar in this scrub will help to exfoliate your feet and encourage new skin growth. The honey and olive oil will help seal in the moisture and keep your feet smooth and soft. The peppermint oil in the scrub will help increase blood flow in your feet and hopefully help with healing any cracking or dryness that you may suffer from. 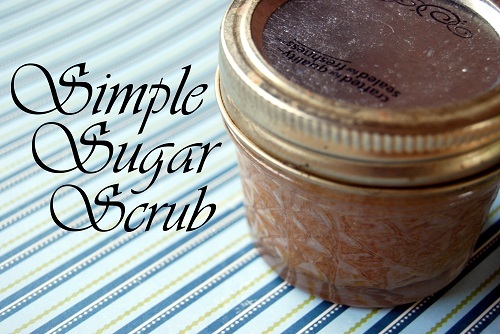 This Simple Sugar Scrub makes a great gift or just make some for yourself! You can also use it on dry, sore and tired hands to soothe, soften, and refresh.